NOTE: The following quotes are approximations of transit times. This does not include delays due to outside factors which may include, but are not limited to: customs clearance delays, weather, incomplete addresses, or POA requests. 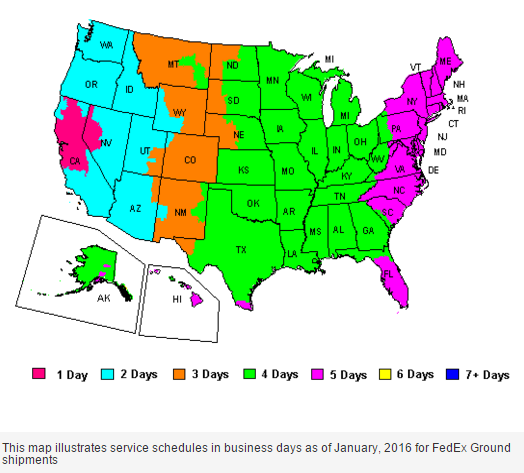 FedEx First Overnight®. Delivery by 8, 8:30, 9, 9:30, 10, 11 a.m. or noon the next business day depending on the destination ZIP code. Available throughout all 50 states (Hawaii service is outbound only). Saturday pickup and delivery available in many areas for an additional charge. FedEx Priority Overnight®. Delivery by 10:30 a.m. the next business day to most areas; by noon, 4:30 p.m. or 5 p.m. to remote areas. Available throughout all 50 states. Saturday pickup and delivery available in many areas for an additional charge. FedEx 2Day® A.M. Delivery by 10:30 a.m. in 2 business days to most areas, by noon to some rural areas. Available throughout all 50 states, except to Hawaii. Saturday pickup available in many areas for an additional charge. FedEx 2Day®. Delivery by 4:30 p.m. in 2 business days to most areas, by 8 p.m. to residences. Available throughout all 50 states. Saturday pickup and delivery available in many areas for an additional charge. FedEx Express Saver®. Delivery by 4:30 p.m. in 3 business days to most areas, by 8 p.m. to residences. Available throughout all states except Alaska and Hawaii. Saturday pickup available in many areas for an additional charge.